in SF, NYC, LA and Chicago. With Almond+ you don’t need another hub to control your smarthome devices. The smarthome hub is already built into it. 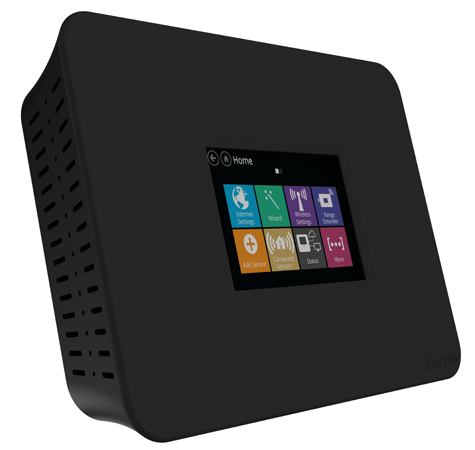 Securifi’s Almond+ updates the household router with a sleek black rectangular device with no antennas sticking out. So far no one from Nest to ADT to SmartThings have found the secret sauce. Securifi presents an interesting proposition by integrating the home automation hub directly into a router making it a powerful connection hub. inspite ot its advanced capabilities. With detachable stand and innovative recessed downward facing ports, Almond+ is designed to be both table and wall mountable. No matter how you place it, you can hide those annoying cables thanks to its innovative recessed connectors. Securifi has partnered with Enjoy to hand-deliver and set up your new router so you can take full advantage of it right away. The best is this service is FREE when you buy from Securifi. Available in the SF Bay area, NYC metropolitan area, Los Angeles and Chicago.